Henry’s TV credits includeappearances on NBC’s The Tonight Show, CBS’s The Late, Late, Show, and NBC’sYoung Comedians Special. He served two years as host of NBC’s Friday NightVideos and had many guest roles on various network sitcoms. 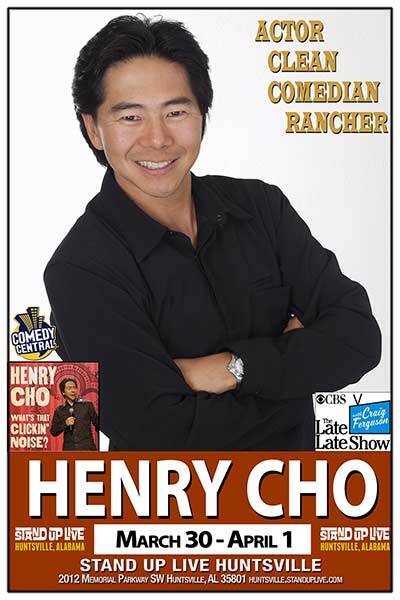 Henry was co-creator,co-producer and co-writer of “The Henry Cho Show” on GAC. Henry’s one hour ComedyCentral Special, “What’s That Clickin Noise?” is currently running and he can also be heard daily on Sirrus, XMand Blue Collar Radio. He’s also a regular performer at the Grand Ole Opry. Some of Henry’s film creditsinclude Universal’s McHale’s Navy with Tom Arnold and David Allen Greer; Say ItIsn’t So with Heather Graham and Sally Field; and Material Girls with HilaryDuff and Angelica Houston produced by Madonna. Henry was the keynoteentertainer for The 59th Annual Radio & Television Correspondents’ Dinnerand has worked extensively with Vince Gill, Amy Grant, Willie Nelson, CarrieUnderwood and many, others. Henry’s clean comedy is so versatile that he can headlineVegas and then tour with Michael W. Smith in the same month. Henry is currently filming theFaith-based Indy film “Saving Faith” in which he will be a featured performerand also co-produce. The movie filmsuntil mid-May.